Travel Tags available now in a store in Singapore! MONOCIRCUS' Travel Tags are now available at Doinky Doodles in Singapore! 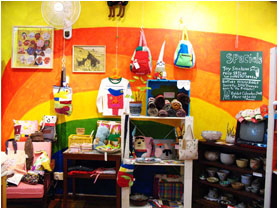 a little store and studio full of wonderful handmade art, run by a Singaporean artist. it is like entering a magical picture book with all these quirky little handmade creatures! Check it out at 33 Bali Lane in Singapore! To our dear customers who have purchased MONOCIRCUS' TRAVEL TAGS, we apologise for not being able to publish this user guide earlier. The ‘fingers’ of the plush TAG are quite fat so the brown ring looks a little tight for them. Here’s how to use the TAG. Sling the TAG through the handle or strap of your luggage or bag. Squish the fat ‘fingers’ together and push them through the brown loop. Hold on to the brown loop firmly then slowly pull at the three fingers at the same time push the loop downward. Do not pull at just one finger. Once you get the fattest portion of the hand through, the rest will be easy. Two cards are attached to each tag.You may choose to write in your name and contact address and number on the back or the inside of the card.Insert the card with the rounded edge first into the grey pocket. MONOCIRCUS' Travel Tags = plush information tag that can be looped onto your luggages, backpacks, messenger bags, tote bags. they make your luggages easily distinguishable from afar! the three fingered portion slips into the loop on the other end to lock. 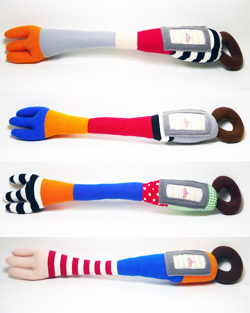 made in soft,plush material and stuffed with poly fill. 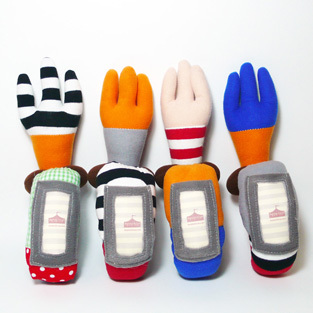 Comes in 4 variations: striped tip, orange tip, beige tip and blue tip!